(CBS/AP) DETROIT - Police say a DNA test has confirmed that the charred body of a young girl found in a burned-out Detroit house was 5-year-old Mariha Trenice Smith. The toddler was last seen a week ago Sunday, when she disappeared from the room where she was sleeping along with her mother Konesha Smith. Smith claims Mariha was sleeping on the floor and didn't notice the girl was missing until 12:30 p.m. when she saw a wide open window. She called the police and an Amber Alert was issued. 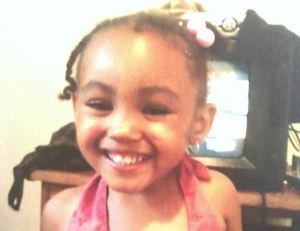 An autopsy earlier this week revealed the girl was strangled and her body was burned after she died. Her skull also had been crushed. Her death is now being investigated as a homicide. "My niece suffered. She didn't have to suffer," said Dominique Poole, Mariha's aunt. "This is crazy." Firefighters found the girl's body around 8 a.m. Sunday on a mattress in a burning two-family house about a mile from her home. According to police, a man was videotaped buying gasoline in the area last Thursday. Authorities have now listed him as a "person of interest" and have asked for the public's help in identifying him. "Right now, we can't bring her back," said Diane Henry, Mariha's grandmother. "Mariha was a happy baby. She was just a happy, pretty baby. She was a special child."